Sonority "could be normal". But his gift to find a groove unlike any other is far from ordinary. In one track he wrings emotions out of you better than drowning Leo and Kate, and in another one he boldly goes so deep in space where not even Starship Enterprise has gone before. His past releases on Traum Schallplatten, Liquid Records and Rune Recordings are a testament to that. 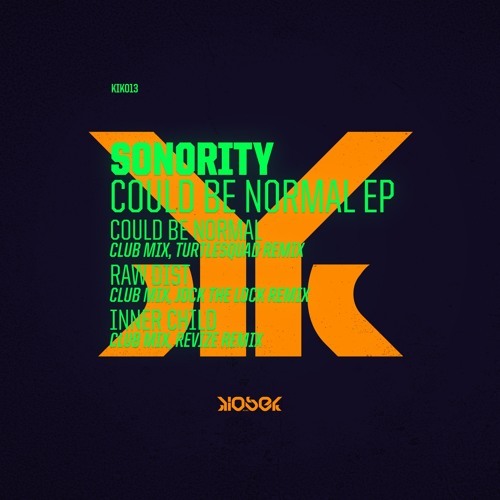 This EP on Kiosek Records brings you club mixes of three tracks that Sonority plans to include on his album, up for release later this year on Distinctive Records. And all three work great on the dancefloor. Remixes are courtesy of Prague-based producers Turtlesquad, Jock The Lock and Revize. We will surely hear more about their talents in the future, including through Kiosek. Sonority himself prefers his food raw. Maybe that’s why his music is so fresh. Bon appétit. Mastered by Gargle&Expel. Artwork by Comandeer.